Stephen Murray (left) in action for Warrenpoint Town. Pic by Pacemaker. Stephen Murray’s transfer to Glenavon on a two-and-a-half year contract signals the end of a long-standing chase to capture the striker by manager Gary Hamilton. Murray is eligible to make his debut for the Lurgan Blues this weekend in the Irish Cup against Carrick Rangers following completion of a switch from Warrenpoint Town. 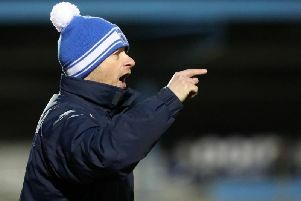 It is Glenavon’s first piece of business in the January transfer window and a deal Hamilton considers a ‘priority’. “I have tried to get Stephen a few times but can only commend his loyalty as he felt he owed it to stay at Warrenpoint,” said Hamilton. “But now he is at the stage of his career when he maybe feels the time is right to try and challenge with a club at the top end of the table for trophies or play European football. “From our viewpoint, we are delighted to get Stephen in as he offers something different in terms of some other forward options in terms of that physical presence, aside of course from Andrew Mitchell. “So if Andrew is injured or needs a rest we now have Stephen as that physical option but I also feel both have the attributes to form a partnership and complement each other together. “We are light on numbers in the squad and have been able to get by to an extent in other areas but came into the transfer window with a striker as a priority. Hamilton has confirmed plans to discuss a loan move for young forward Jordan Jenkins to bolster his playing time and help progress the player’s development in the same way Bobby Burns enjoyed the benefits of a short-term switch to Knockbreda. A Warrenpoint Town statement described Murray as “a dedicated pro” and offered thanks “for all his efforts while wearing the blue jersey for us”.